Maximum Bit Rate (Mbits/s): 10, 100, 1000, etc. Physical Transmission Medium: Coax, Fiber, UTP, etc. One of the things that has made Ethernet so widely adopted is the OSI model. OSI stands for Open Systems Interconnection, and it is a model of the many complicated layers involved when two intelligent devices share information. The OSI model is mostly a theoretical framework, ideally setting up standard interfaces from one layer to another. With this model, you, as the developer of the application layer, do not need to know about the physical medium that data is being transmitted, you can just focus on presenting the data. 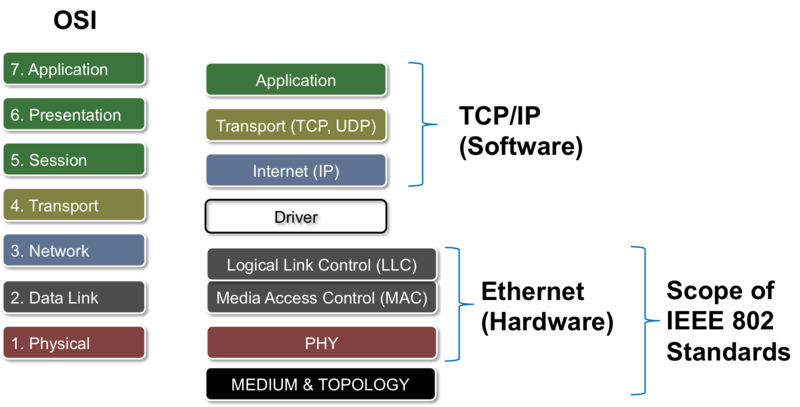 In theory, the OSI model is seven layers, but in reality, these layers can be mapped to software and hardware applications. 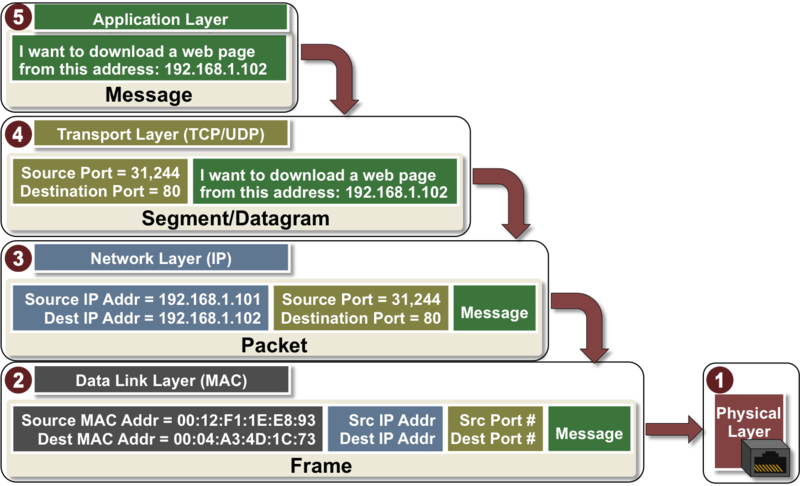 Here the OSI model is mapped to the Internet Engineering Task Force TCP/IP (Software) and Ethernet (Hardware) realities. What Does Each Layer Do? Physical Layer – The Physical layer encodes and decodes the bits found within a frame and includes the transceiver that drives and receives the signals on the network. This layer handles the speed and medium that the data is transported on. The Physical layer is where data is translated from digital 1s and 0s to analog signals. Microchip switches can communicate over CAT-5 cables at 10 Mbits/s, 100 Mb/s and 1000 Mb/s. Data Link (MAC) Layer – The Data Link layer is responsible for creating the frames that move across the network. These frames encapsulate the packets and use MAC addresses to identify the source and destination. The MAC also checks to see if the data is complete and passes some basic CRC error checks. Network Layer – The Network layer is responsible for creating the packets that move across the network. It uses IP addresses to identify the packet’s source and destination. Transport Layer – The Transport layer establishes the connection between applications running on different hosts. It uses TCP for reliable connections and UDP for fast connections. It keeps track of the processes running in the applications above it by assigning port numbers to them and uses the Network layer to access the TCP/IP network. Application Layer – The application layer is where applications requiring network communications live. This is the top level application that normally is exposed to the general user. Examples of these applications include email clients and web browsers. These applications use the transport layer to send requests to connect to remote hosts. To send and receive data across a TCP/IP network, data is passed to each lower layer, which will add to the data until the full packet is formed. This is a simplified view of how the network layers work together to generate frames. Higher layers pass information to lower layers. Each layer adds information called a header to the data being passed to it. This header contains information the layer needs to perform its job. Application Layer – The Application Layer generates a Message. In this case, the specific application is a web browser requesting a web page download. This message is then sent to the Transport Layer. Transport Layer – The Transport Layer adds the TCP or UDP header which includes the source and destination port addresses. Additional information like the packet sequence number used for TCP will also be added to the header. The data generated by the transport layer is referred to as a Segment if TCP is used, and is referred to as a Datagram if UDP is used. This segment is then sent it to the Network Layer. Network Layer – The Network Layer adds a header including the source and destination IP address to generate a packet. This packet is then sent to the Data Link Layer. Data Link (MAC) Layer – The Data Link Layer adds a header containing the MAC address information to create a frame. The frame is then sent it to the Physical Layer to transmit the bits. When the frame is received in the Data Link layer, the destination MAC address is compared with its own. If the data received is not intended for that host it is immediately discarded. If it matches, the header is stripped and the payload, which in this case is a packet, is forwarded up to the next layer. 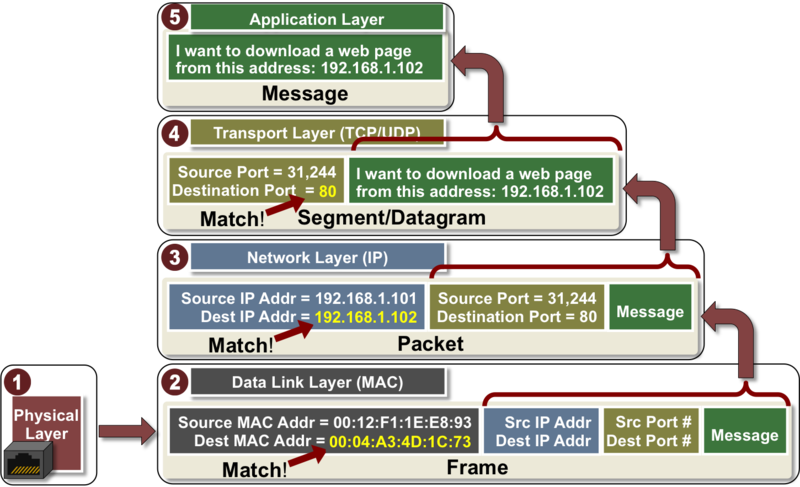 Here the Network layer checks if the destination IP address matches its own. If it matches, the header is stripped and the payload is forwarded up to the next layer. Here the Transport layer checks to determine if there is a process running on the host with a destination port number of 80. In this case there is, so the header is stripped and the message is sent to process number 80 in the Application layer. Process number 80 is a function running in the HTTP server. This completes the message transmission process from one application to another.